My hubby's favourite sweet is Basundi!very easy to make..just need some patience:-)Follow this recipe for an easy version of basundi! Chop the nuts and keep it ready. Add milk to a deep bottomed pan (i usednonstick one) and simmer it till it is reduced to almost half.It may take atleast 20mins so keep stirring in between so that it doesnt get burnt at the bottom. Now add condensed milk to it and mix it well.Keep stirring to avoid burning at the bottom. Add 4 to 5 saffron strands and let it boil for atleast 8 to 10 mins in low flame.You can see malai forming,Keep stirring.Now add sugar and whisk it well.Scrap the sides. 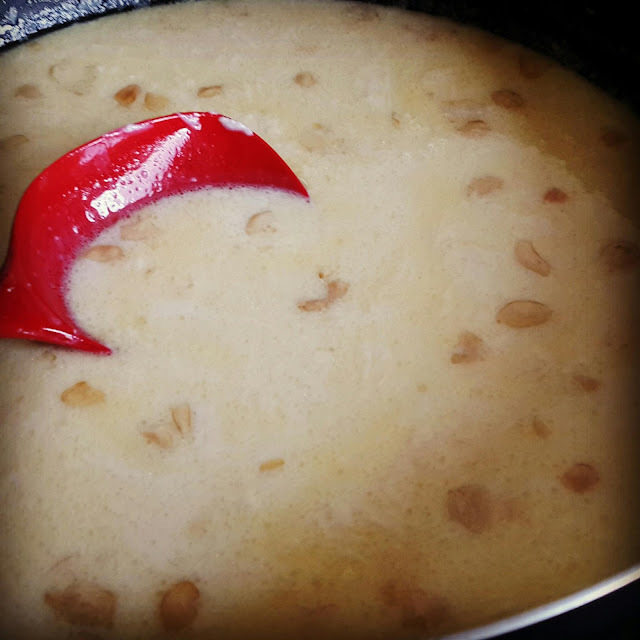 Once milk is thick and creamy with malai formed add the nuts and let it simmer for few more minutes. Add nuts powder along with cardamom powder.Once it is thick and creamy switch off.As it cools downs it will get more thick. Refrigerate for couple of hours and serve chilled!